Bonfire Night is almost here, so we've put together a spark-tacular guide to some of the region's best displays. If you're travelling with the family you can make a saving on your travel with a Family Day Ticket - just £10 on the Go North East app or from your driver, and covers up to 2 adults and 3 children under 16. People aged 18 and under can also travel for £1 each way with our flat single fare. As well as a fantastic fireworks display, there’ll be fairground rides, a huge bonfire, entertainment from Metro Radio and some fantastic prizes from intu Metrocentre. Tickets must be purchased in advance for the display - you can buy yours here. We'll be running a special bus service from Gateshead Interchange as well as our Angel and Coaster services that stop outside the park entrance on Durham Road. Stanley Fireworks returns this year on Saturday 4 November providing a full evening of entertainment for everyone including a spectacular Sci-Fi themed fireworks display, face painting, children's characters, fairground rides and a fancy dress competition. This FREE display takes place on Saturday 4 November, with the lighting of the bonfire at 6.30pm and fireworks set off at 7pm. Food and glow products will be available on the Sele. St Cuthbert's Hospice most dazzling spectacle will light up the skies on Saturday 4 November at Framwellgate School. This year the event will have even more children's fairground rides, hot food and drinks to keep you warm, and plenty of fun for all the family. Chester-le-Street Riverside Fireworks returns this year and promises a fun filled evening of spellbinding entertainment for all the family, featuring a spectacular witches and wizards themed fireworks display set to music. There will also be a funfair, food and refreshments and a fancy dress competition for kids. 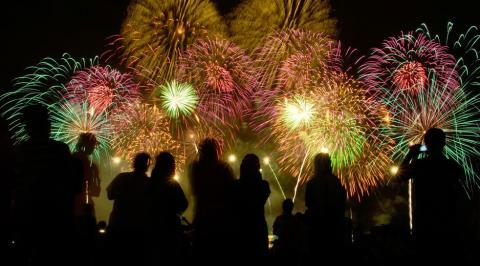 Celebrate Bonfire Night in style with a sparkling display at South Shields seafront. Watch as the fireworks shoot across the sky and burst into colour! There will be two FREE firework displays, one at 6.30pm with the main display at 8pm. North Tyneside Fireworks Display will return to the Links in Whitley Bay on Sunday 5 November. Thousands of people attend to watch the spectacular display that overlooks the North Sea near St. Mary's Lighthouse. There will be fairground rides and refreshments from 6pm and the display starts at 7pm.